Laminating — Becky's Die Cutting, Inc. Improve the appearance and durability of your project in one simple step. At Becky’s, our custom lamination service gives your project the look and feel to stand above the rest. With specialty films, we can help you create any look from leather to linen, metal, wood and iridescence—even holographics. Plus we have huge film inventory in stock when you need the work done fast, and we charge by the foot, not by the roll, so you only pay for what you use. We laminate everything from book covers to menus, outdoor signage, dry erase surfaces, floor graphics, and more. Our automated 27” x 40” high-speed laminator can do one- and two-sided projects to achieve any results you want. And our wide-format laminator can handle projects up to 42”. We work with 1-, 2¼- and 3-inch cores, and our laminate thickness can be 1.5-, 3-, 5-, or 10-mil in a full range of laminate films. 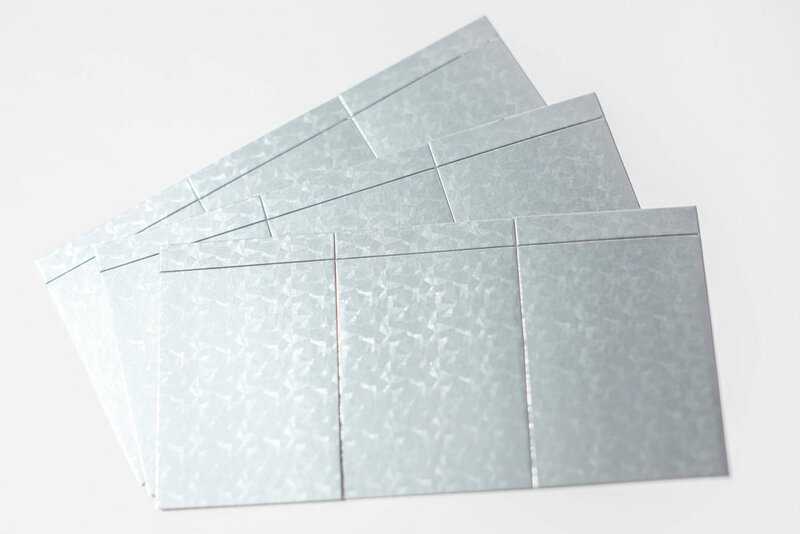 Metallic films range from the looks of brushed metal to pewter. abilities, and they can even be applied over digitally-printed materials. Holographic films, also known as security films, are transparent polyester with embedded images, often used on I.D. badges.